Today, You are going to know top 10 places to get background music for youtube videos free in 2019. If you are a Youtube creator and looking for the Free background music for youtube videos, you have landed on the right page. Let’s get started with the list! With over 600,00+ tracks and sounds, Audio Jungle is one of the top websites to download background music for youtube videos free. 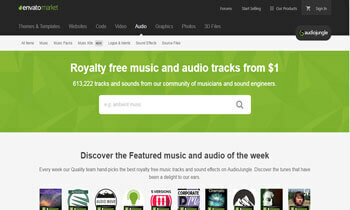 Audio Jungle is part of the Envato Market. It’s one of the most popular stores for online assets. So far, they have contributed over 3 million digital products in the market. 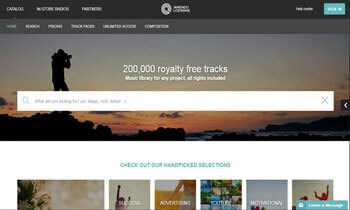 Audio Jungle is a rich place for all genres of royalty free music from pop to heavy metal. And music from nearly all the categories for that matter. There is a plethora of music collection on Audio Jungle for all type of users. However, Audio Jungle is not entirely free. The pricing on Audio Jungle starts from $1. But there are some free tracks as well, which you can choose from. Besides, they also conduct freebies every now and then and offers premium royalty free music at no charge at all. All in all, Audio Jungle is indeed the best website to download Royalty free music. If you will use Audio jungle to download background music for youtube, most probably you won’t need any other website after that. If you ask anyone about the best place to download background music for youtube videos free, the first answer you will hear is the Youtube Audio Library. It’s one of the most popular youtube background music downloading sources. It won’t be wrong if we call Youtube Audio Library a treasure for public domain and Royalty free music. The reason why Youtube Audio Library is preferred so much over other platforms is the ease of availability. To download background music from Youtube Audio Library, you no need to visit or sign up on any other website than Youtube. Just Go to Creator Studio > Create > Audio Library. And that’s it. After reaching the Audio Library, you can find and download your favorite music from the list. There is also an option for Sound effects to choose from. The best thing about Youtube library is the multiple sorting options. You can sort your favorite music on the basis of your mood, genre, Instrument type, video duration and so forth. Free Music Archive is my next pick as the best place to download background music for youtube videos free. 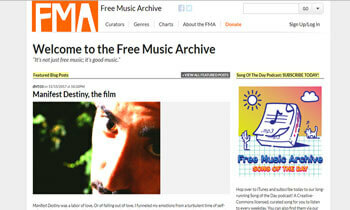 FMA has a very large repository of free music. Free Music Archive has a big library of public domain music which has over 2000+ songs, reusable for various purposes. The Music on the website is very well categorized in different genres like Blues, Electronic, Hip-hop, classical, folk and a lot more. Not just that, you can also upload your songs on Free Music Archive to contribute to the collection. And help the website grow in terms of Good music acquisition. The music collections on Free Music Archive comes under the creative commons and other licenses which are eligible to be used for different purposes. But the good thing is, they have pre-cleared the terms and conditions for every music on Free Music Archive to avoid infringement of any copyrighted laws. So, you can use any music of FMA for various purposes without paying anything. But do mind the conditions they are meant to be used in. Free Music Archive is entirely free public domain website. But if you want to show your courtesy for the music you get on FMA, you can donate your desired amount to contribute to the website’s maintenance. 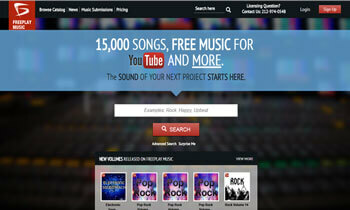 AudioBlocks is yet another place to get background music for youtube videos free. AudioBlocks has a tremendous collection of music, loops and sound effects. And the best part is the music collection on the website is consistently updated with the new tracks. On AudioBlocks, You can quickly search for your desired background songs you want with advanced search options on the website. You can sort the music on AudioBlocks based on their genre, mood, tempo, instruments etc. The moods can be anything from Aggressive, Epic/Inspiring, Happy, Upbeat, Relaxing to any of your desired moods. And there are a lot of music genres and Sound effects which you can go for. 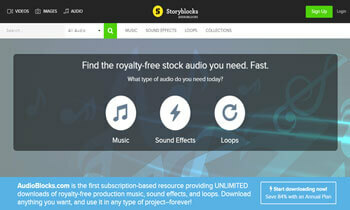 The music on Audio Blocks is Royalty free. And it can be used for any personal or commercial use without any legal issues. But remember, AudioBlocks is not completely free. However, they have affordable pricing modules, but they do charge for the Royalty free music they offer. But once you subscribe to AudioBlocks subscription model, you become their premium member. And thus, you get access to the huge AudioBlocks library. And unlimited music, sound effects, loops will be at your fingertip. The Epidemic Sound music company was founded in 2009. And it’s doing really great ever since. It is one such music archive website, which can be a go-to place for an Artists. Not just Youtube but for all sort of music demands, Epidemic Sound turns out to be a splendid platform to rely upon. Acoustic, Blues, Classical, Drones, Country, Latin, Jazz, Rock, Reggae or Hip Hop, Epidemic Sound is there to offer music from nearly all the categories. As per the company, they have a collection of over 30,000+ music tracks in their library. And not to say, it’s higher than most of its other companions. Not just music, but everything about the website is compelling. 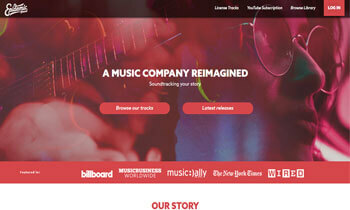 The design, interface and color combination used on the website is really eye-catchy. The only thing which is not as appropriate as some of its companions is the pricing. 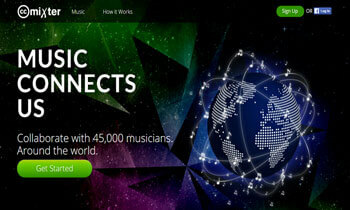 Epidemic Sound does not offer any free soundtracks even under Creative Common and Public License. But you can go for the Free 30 day Trial subscription, before opting for any of their premium plans. Jamendo is a popular name in the music Industry. And perhaps, you have already heard that name! You can’t just get background music for youtube videos on Jamendo but all sort of music you can think of. If we talk in numbers, Jamendo has over 500,000 tracks available by 40,000 artists from over 150 countries all over the world. And it has got over 250+ million downloads since the launch of the platform. The feature which makes Jamendo a popular name across the globe is its availability in multi-languages. jamendo is available in English, French, Spanish, German, Italian, Polish, Russian, and Portuguese. Jamendo offers free music download for personal use. But If the music is to be used for commercial purpose i.e. Youtube, ads, films, etc, you need to buy the license from Jamendo. They have four licensing packages for the different range of users including. Personal, standard, Large, and full scale. All the packages include a different set of features to choose from. So it’s up to your demands that which Jamendo license suits you the most. Now let’s move forward to my next pick for the best place to get background music for youtube videos free. If you are looking for background music for youtube videos free, FreePlay music is the best website you can visit. It has a numerous collection of music and sound effects for personal as well as business uses. With over 15,000 songs in its library, FreePlay Music is a tremendous source to download background music for youtube videos free. The design, layout, and working of FreePlay music is pretty impressive. And I love the way it is organized to offer the most convenient search options. 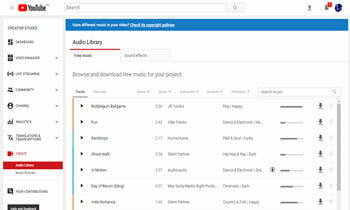 Where most of the other top music sources offer just a simple search field to dig out the music from there library, FreePlay Music has most sophisticated sorting options. On FreePlay Music, you can narrow your searches based on different criteria like artists, composure, mood, music duration, feeling, instrument, Tempo, volume name etc. Besides, FreePlay Music is completely free to use as long as you are using it for the personal purpose on Youtube and other platforms. But if you decide to use the music for commercial or business purposes, you need to go premium and pay their desired amount. So depending upon your need, you can buy music tracks on Freeplay music or use it for free. So all in all, for any kind of free background music for youtube, FreePlay Music is the ultimate source which can be relied upon. 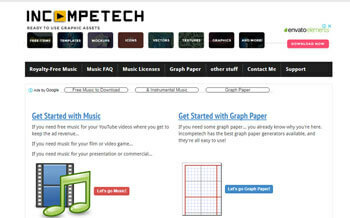 Kevin MacLeod is a popular music producer and composure from America and Incompetech is his music collection. If you are a Kevin MacLeod fan and loves his work, Incompetech is just for you. Unlike other sites to get background music for youtube videos free in the list, Incompetech contains music from just one artist, which you can use in your videos, video games, films and other musical projects. The music collection on the website is absolutely Royalty free. And you can use it for free by attributing to the artist. But in case you do not want to give credit to the website, you can still use the music from the website by buying the license for $95 for the lifetime. But if you want just one, two or more than two tracks from Incompetech, there are different pricing modules. For a single piece of music, you need to pay $30. However, the Interface of the website is not very impressive. But you can easily search for your favorite music by viewing the music collection on the website or making a search on website based on the genre, feel, tempo, length etc. If you haven’t yet found your desired Royalty Free music so far, give Ben Sound a try. I’m sure you will like it. 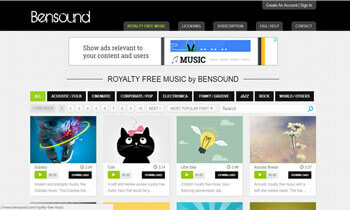 BenSound is especially a music-oriented website for Royalty Free music. It has a collection of satisfactory music tracks to download. The features which I like the most about Bensound is the easy Interface. Unlike other messy websites, Bensound doesn’t have lots of confusing options. Instead, there are just three primary options on the main menu including Royalty Free music, Licensing, and Subscription details. On the Royalty Free Music page, you will see the Music from all the genres including Acoustic, folks, Funky, Jazz, Rock, Pop etc. You can also sort the music on the basis of newest or popularity. Besides, you can also search for your desired tracks through the search field located on the home page. But mind it, BenSound is not entirely free. However, you can use the tracks that fall under the creative commons license for free, but you have to give credit to Bensound for that. If you don’t want to credit Bensound to use their music, you need to buy the music. The last place to get background music for youtube videos free is ccMixter. ccMixter is not exclusively designed for Royalty free background music, but it’s far beyond. ccMixter basically features remixes and original samples uploaded by 45,000 musicians around the world. These samples and remixes fall under creative commons. Therefore, you can download them anytime for free from the website. And reuse them as per your need. However, not every song or music uploaded on ccMixter comes under Creative Commons license. Some songs and music might have different terms and conditions & restrictions for reuse. But other than that, there is a vast collection of music on ccMixter that can be used for various purposes, that too for free. Till date, the ccMixter site has been used in over 1 million videos and games. So if are not satisfied with the above websites to background music for youtube videos free, try out ccMixter once. Perhaps, it’s the destination for you. For a Youtuber, the value of Background music is immense. A video with background music is far different than a video without music. A video, that has a background music can hook your audience with the videos for a longer time, while videos without music bore the audience. And needless to say, none of us wants to let our audience go away due to thin contents. In this article, I’ve provided a list of 10 places to get background music for youtube videos free. And I can assure you about the significance of the article. With this, I’m done. Now it’s your turn to let me know your views about the list. And if you know any other website to download youtube background music for free, mentioned that in the comment section below.